The Hazara nationalism was a response and reaction to the Afghan Nationalism. Hazaras thought that they were not being represented well, and they were kept away from political decision making process. The Hazara nationalism emerged in 1980s, and kept changing with circumstances. As identity is historical, and changing, I will examine the historical literature and political music to understand what kind of nationalist ideology is being promoted in 1980s and 1990s by Hazara historians and artists. My primary sources are the historical literature and the political music of eighties and nineties. The questions I try to answer are: why such literature was being written, what are the popular discourses in these texts and music, and what is the advice of the writers of these texts and artist who sing? By 1960s and 70s constitution was introduced in Afghanistan. Free press and political parties began to emerge. Hazara intellectuals took active part in politics in sixties and seventies; some were members of communist parties such as PDPA (Peoples’ Democratic Party of Afghanistan.) New Democratic Movement (A Maoist group). Others were member of religious movements such as Sazman-e Mujahideen-e Mosataz‘fin-e Afghanistan. 1 These groups were demanding more rights, and advocating for change in governance in Afghanistan. In 1978, there was a communist Coup by PDPA party, and the old political structure ended. Unpopular and inexperienced regime took power. In a year, the government lost support and was dysfunctional; Soviets came to the rescue to stabilize the situation. In 1979, Hazarajat was among the first regions to declare its autonomy and resist against the state. In 1979, a political party was formed to keep security in Hazarajat; Shor?y-e Itafaq was formed, after the council of 1200 Hazara khans and Mullahs.2 For the next ten years, Hazarajat was ruled by Hazaras themselves. Then, there was a long period of competition in Hazarajat between different political groups and different ideologies. There were questions on what it really meant to be a Hazara in modern sense. There was tension up until the end on what really should constitute Hazara identity. Itah?dya-e Mujahidin Islami Afghanistan was formed in 1979 based in Quetta that included Hazara nationalists, and Hazara political refugees who had fled the war in Afghanistan.3 Since the time of resistance to the Communists and Soviet Union coincided with the Islamic Revolution in Iran. Many political clerics were influenced by the Islamic revolution there. Several organizations were formed in Iran that upheld Khomeini’s ideology of Guardianship of the Jurist (Wilayat-e Faqih). These parties were Nehzat Islami Afghanistan, Sazman-e Nasr Afghanistan, Jabha-e Azadibakhsh, Pasdaran-e Jihad Islami.These parties that had Iran’s support too, challenged the locally elected Shor? and defeated them by 1994. In 1980s a new kind of music began to develop, and it was called ?hangha-e inqil?bi (the revolutionary songs). It was political music, and it promoted freedom, awakening and political mobilization. The first person who started revolutionary songs was Sarwar Sarkhosh and his main message was for the young generation to rise and fight oppression and occupation. O the free Tulip, O young generation rise! Lions have given birth to you, with that remembrance, rise! O Hazara, when will you be free from slavery? In conclusion, he writes that the resistance forces that were fighting Amir Abdur Rahman in 1890s were fiercely crushed. According to him, it was a result of the discord and betrayal between the different tribes and ethnicities. The tyrant Amir could gather army from amongst the people and use against people and massacred people of Afghanistan. The houses of people of Panjsher, and Laghman were burned down. Thousands of people from Badakhshanis, Qataghan, and Turkistan were forced to migrate after massacre. Two third of the Hazara people were completely eradicated. He also lists the many acts of injustice done on their fellow Pashtuns too by the tyrant Amir. He says that Amir stabilized a colonial government (am?rat-e ist’am?ri) in Afghanistan. He ruled an Afghanistan that is in bloodshed and in deep sleep and unaware of the progress and civilization of the world. Gharjistani says that the invasion of Afghanistan by Soviet Union has brought new Amir Abdur Rahmans such as Tarakai, Hafizullah Amin, and Babrak. Gharjistani praises the unity of the people against the unjust ruler. He thinks that the people of Afghanistan should leave aside other minor prejudices, and unite against the main enemy the Soviet Union and its servants. Gharjistani argued that people should rise against the new Communist state that is unjust like people resisted hundred years ago against Abdur Rahman. In 1980s there was a journal which was published in Kabul called Gharjistan1 on the history and culture of Hazaras. Hazaras made significant population of Kabul, and for the first time in Afghanistan’s history Hazaras were taking high position in the government such as Sultan Ali Kishtmand who was the prime-minister for a decade. 1 Gharjistan is one of the historical names for today’s Hazarajat. N?yil wrote his S?ya Roshanha-ye az wa’z Jame’a Hazara (The dark and bright sides, On the conditions of Hazara Society) in 1985 in Kabul. It was printed by the government publishing house. It is a book of introduction on the Hazara history and Hazarajat’s geography. The book is pro-government and very much in line with the ideology of national reconciliation (?shti m?ll? ). By 1985, the Communist government had introduced this ideology to get the support of the different ethnicities in Afghanistan. The book starts with saying that our homeland is constituted by many nationalities and tribes that live together side by side in unity (hambastagi). N?yil critiques the lack of historical literature on the cooperation (y?ri wa hamk?riha) of the people of Afghanistan, and critiques the previous systems of governance in Afghanistan that has been oppressive and discriminating (tab’iz gar wa sitam gostar).The states have tried to keep the different nationalities apart and discriminated one over the other. N?yil is optimist that now; it is time to reconcile the damage done. N?yil critiques the previous regimes on the basis of the politics oppression, Hazarajat was divided in 1963, and each part was given to surrounding provinces. Hazarajat lost centrality (markaziat), and did not profit from the government economic plans. Hazarajat has been discriminated against by being divided into many parts with out taking into consideration the problems of the people, ways of transportation, and economic connection. N?yel argues that the Communist government is to the benefit of all nationalities. The social condition of Hazaras has been bad for a hundred years from the times of Amir Abdur Rahman up until Dawood. It is only with the Communist that things are changing for Hazaras. The late 1980s was a high time of Hazara political songs; it was more diverse and more popular. Almost all the revolutionary songs were sung in concert and hundreds of people used to listen to it. Quetta city in Pakistan had become one of the cultural centers for the Hazara society. After the 1978 Coup, Hazara refugees had gathered in Quetta to fled the Communist regime, or to escape the insecurity in Afghanistan. Political and cultural groups were being formed or reorganized for political activities in Afghanistan. Among the singers who sang revolutionary songs in the late 1980s were Dawood Sarkhosh, Rajab Ali Haidari, Safdar Tawakoli, and Ghazanafer Ali. Dawood Sarkhosh was Sarwar Sarkhosh’s younger brother and his first concert was in 1989.12 Dawood sang in a historically different context than his brother Sarwar. His first concert was in 1989, and among the political singers, he became very popular. K?r ha-ye rang ba rang da zid Azragi mosha. Hazaras were known for doing the menial labor, in the cities, for example, Jow?li or Hazara-e b?rkash (the carrier of big sacks or load) was very often their jobs in cities. Jow?li was also one of the symbols of oppression of Hazaras. In the revolutionary songs, Jow?li is the motif that is repeated. One theme is that we no longer accept to be a Jow?li for others. In other words, we break free of the oppression and want to determine our own future. Whether a son of a porter become a leader. This song is in response to general prejudice that Hazara is best suited for becoming a jow?li and they cannot be an official or a leader. Political songs like the historical literature defined Hazara identity, and it was also answering the question of “who are we?” In this song, what define Hazaras are qualities of hard work, virtues of honesty and courage and an aptitude for political activism. The singer has the peasants and workers in mind, since this song is very simple to understand. It is very much like political slogans. This song also uses the symbol of the “mountain”, (Farzandi kohistoni) like many other political songs, since Hazarajat is very mountainous. This poem was written by Reza Wasiq in 1989, and later sung by Ghazanafar in Quetta. In this poem Hazara is portrayed as having power, and sovereignty, and he is not Jow?li and weak. Hazara is linked to the bird of prey, sh?hin or falcon of the mountain, and the lion of dessert, and free spirit wild flower L?la or Tulip that grows in the spring. By late 1980s and early 1990s there were more and diverse works in historical literature. By this time Hazara identity was better defined. The ideology of Hazara as a nation was fully formed with Hazara having a unique history, language, culture and territory. For example, Tarikh-e Hazara wa Hazaristan, by Eisa Gharjistani, The Hazaras by Hasan Poladi. Pojohish der tarikh-e Hazara ha by Hussain Ali Yazdani and Hazaras of Afghanistan by Syed Askar Mausavi are representations of hazara identity forming and discussed in the intellectual circles. The purposes of these works were to answer, “Who Are We?” These historical works tried to answer where Hazaras are originated from? Whether they are native to Afghanistan or they have come recently? These works dealt with origin of the name “Hazara”, why and how it came to identify these people? There were research on the tribal structure and tribal relation of Hazara society? There were researches on the language of Hazaras, trying to answer when and how Hazaras learned to speak Persian, and comparison of Hazaragi dialect with other Persian dialects? There were research on the religion and culture of Hazaras, trying to answer why and how did most of Hazaras accepted Shia as religion? There were research on the geography of Hazarajat, and historical geography and why did Hazaras chose to settle in these mountainous region? Yazdani classifies the Hazara history into three periods: The Age of Greatness, and Power; The Medieval Age; The age of Oppression and Depravity (mazlumiat wa mahromiat). The age of Greatness and Power starts from the beginning extends to the Eighteenth century. The Medieval Age is the time when Hazaras were equal in status with other groups in Afghanistan. The Age of Oppression and Depravity starts with the coming of Abdur Rahman to power and his attack on Hazaras. In general Hazara historians have this conception of time in mind, when writing history. Eisa Gharjistani’s Tarikh-e Hazara wa Hazaristan can be seen as an ideological shift in terms of conceptualization of Hazara identity. It is significant that he titles his book “Hazaristan”, not Hazarajat, before these all the works written on Hazaras, called it Hazarajat, referring to a region in Afghanistan that is mostly populated by Hazaras. Gharjistani had a nation (milat) or a (collective unit) in mind in the modern sense when writing about Hazaras that had unique language, history, rights of self-determination and territory. National consciousness (Khud ?g?hi milli ), Hazara nation (millat-i Hazara), and Nationalism (milligar?i) are frequently used words in the book. In his book, Gharjistani, promotes Hazara nationalism, in which all Hazaras unite despite their tribal background and religious differences and sects. He criticizes the religious political groups in Hazarajat that have outlawed (takf?r) Hazara Nationalism as un-Islamic. He downplayed ethnicity as important factor in Hazara identity. According to him, identity based on race or ethnicity as ideology can lead to NAZI style fascist government. Nationalism based on race is not good, it is irrational and narrow minded and it can lead to more problems. The nationalism based on race has not worked in Afghanistan, and non Shia Hazaras do not unite with Hazaras of Shia group. Hazaras as a nation should strive to empower itself on political stage and its lifts its social position. Hazaras should strive for religious and political rights, and cooperation with other nationalities in Afghanistan. Afghanistan is multicultural society so; every culture should be respectful of other groups. One question that is difficult to answer is the origin of Hazara, and there are various interpretations on this. One of the major theories is that Hazaras are a combination of both Turkomen and Mongolian groups that have settled in Afghanistan some time after the thirteenth or fourteenth century. Other theory is that they are descendants from the Mongolian army that have integrated into the culture by learning the language and inter-marrying with other tribes. Other theory is that Hazaras are one of the natives of Afghanistan and they have been here for very long time. There is very little written on the early history of Hazaras and many Hazara historians draw on the works of American and British anthologists, foreign tourists, and traditional myths and legends. In short, by examining the political music and historical works in historical context, one clearly sees a Hazara nationalism emerging and forming during the period of great change and transformation in Afghanistan. Hazara nationalism is recent phenomenon, even though, Hazara as an ethnic group has existed for long time. Before 1970s, there was not Hazara national consciousness, definite Hazara identity, knowledge of history and pride in Hazara culture. Emergence of Hazara nationalism was a cultural movement as much as it was part of a political mobilization. In Hazarajat by 1989, Hazaras united under one political party. In cultural sphere, there were print media such as journals and books, and electronic media such as radio and tape recorders that were effective tools in informing and shaping Hazara identity. The political songs on radios were heard instantaneously every where in Hazarajat, and copies of it on tapes were recorded and disseminated. By 1980s and 1990s, there are discussions and debates among intellectuals, and artists on defining and interpreting a Hazara identity. Hazaras renounced their tribal and feudal fetters and trying to shape collective solidarity that is beyond the notions of tribes and family relations but based on differing political and religious ideologies. 17. Yazd?n?, ?usayn ?Al?, Pizh?hish? dar t?r?kh-i Haz?rah?h?. Canfield, Robert, Hazara integration into the Afghan nation: some changing relations between Hazaras and Afghan officials. Afghanistan Council of Asia Society, 1973. Dowlat abady, Basir Ahmad, Shenasname Afghanistan. Tehran: Irfan, 2003. Gharjistani, Mohamad Eisa, Tarikh-e Hazara wa Hazaristan. Quetta: Shor?yi Farhangi Islami Afghanistan, 1989. Harpviken, Kristian Berg. Political Mobilization among Hazara of Afghanistan: 1978-1992. Oslo: Institutt for sosiologi og samfunnsgeografi, 1996. Kakar, M. H. The Pacification of the Hazaras in Afghanistan. Afghanistan Council Occasional Paper, No. 4, New York. ,1973. Mohamadi, Mohamad Amin, “Dar J?stajo-e Howiat” in Siraj. Qom: Markaz Farhangi Nawisindagan-e Afghanistan, 1997. Mousavi, Sayed Askar, The Hazaras of Afghanistan: an historical, cultural, economic and political study. Richmond, Surrey, UK. : Curzon Press, 1998. 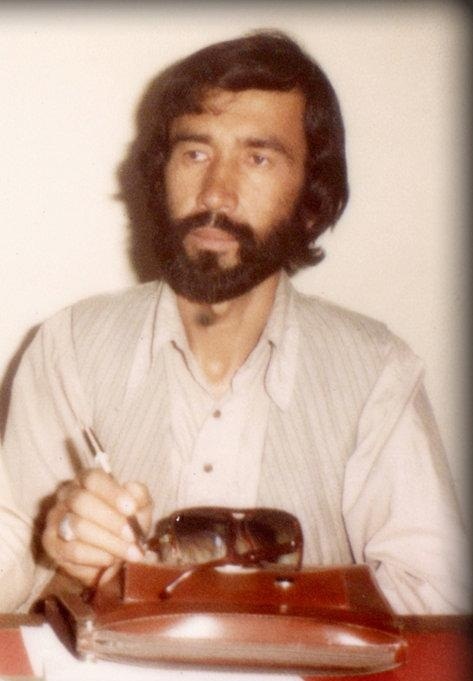 Pouladi, Hasan., Trans: Ali ?lami Kirmani, Hazara ha: tarikh, farhang, syasat, iqtisad. Tehran: Irfan, 2002. Yazd?n?, ?usayn ?Al?, Pizh?hish? dar t?r?kh-i Haz?rah?h?. Qom: Chapkhana-e Mehr, 1993.